It’s been an amazing five years: from the charming vaults of Henderson’s to those legendary exploding water-balloons at the Forest Café. From Mediterraneo and the masks of Carnevale at Summerhall to the mists of Inverness and Orkney. From those quiet please-listen-to-our-songs nights to the madness-possessed-Tarantella dancing of today. - also, our tantrums now are more sporadic than they used to be but we can still scream the house down. Soooooo! 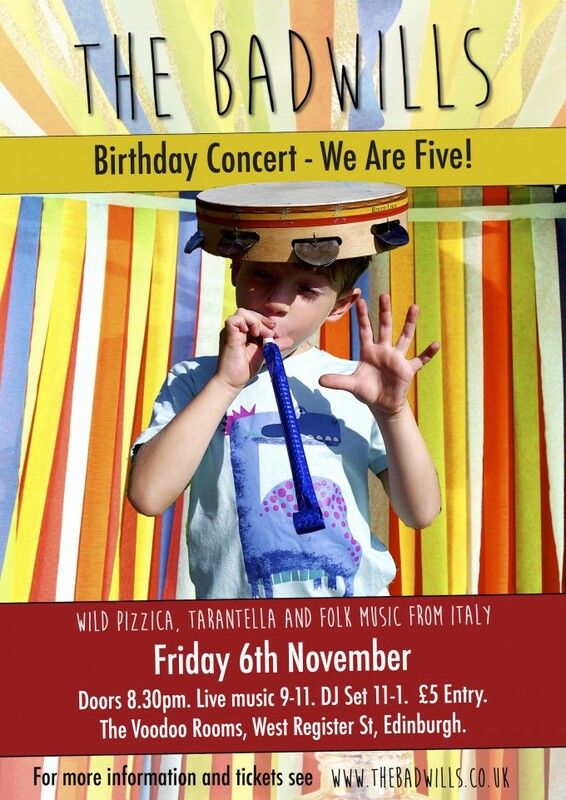 Come and celebrate the Badwills’ 5th birthday with an epic Tarantella fueled party that will twist and shake your legs, your feet and your entire existence. There will be cake & balloons, friends & lovers, tambourines & spiders & drinks. We will be playing from 9-11pm, so don’t be late! From 11 till close we all get to jive together to DJ Tyler Parks and his weird and wonderful collection of vinyl from around the world. Time: Friday 6th November. Doors 8.30pm. Live music from 9pm – 11pm. Venue: The Ballroom at The Voodoo Rooms, West Register St, Edinburgh. EH2 2AA. Tickets: £5 Entry. Presale tickets available from: http://www.brownpapertickets.com/event/2396059 or there will be a limited amount on the door on the night.